Baleka Resort Hotel and Spa, is strategically situated in Legian, about 20 minutes from Ngurah Rai International Airport. 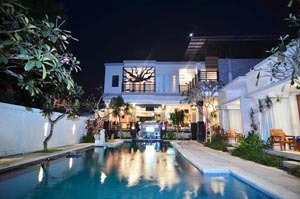 This hotel is very close to some famous Balinese beached like Kuta Beach, Seminyak Beach and of course Legian Beach. Some places like Kuta Galeria Shopping Arcade and Kuta Art Market are also near. Baleka Resort Hotel and Spa offers comfortable and spacious rooms combining modern and traditional design. These rooms include balconies with pool or garden view, a set of minibars, and personal safes. There are also high speed internet access through Wi-Fi and 29 inch plasma TV with international channels. This hotel is set in a well compounded lush tropical garden with a large size of outdoor swimming pool , swim up bar, and restaurant. If you want to go out and enjoy the atmosphere of Bali, shops and cafes are in a walk distance. Trying spa services is also a good choice to pamper your body and soul during your holiday activities in this beautiful island. Experience the refreshment and relaxation of Indonesian indulgences treatment. Professional spa therapists of Bamboo Spa are ready to serve you in a well appointed treatment rooms. Complimentary breakfast is served every morning. Concierge services, wedding services, and tour assistance are available upon request. Other facilities include a children’s pool, a rooftop terrace, a snack bar/deli, and free parking lot. Transportation including a roundtrip airport shuttle and area shuttle need extra charge. Baleka Resort Hotel and Spa always try to give you the best service to ensure you have a nice holiday. With Baleka Resort Hotel and Spa, feel home while away from home! My self and my boyfriend stayed at Baleka for 6 nights in Oct 2012. I thought it was a great place to stay, good price, nice pool area and great location. We didn’t once hear construction noise in our room, and while at the pool it really wasn’t noticeable. The staff here were all lovely. The only bad thing was our bathroom really stunk some days, but we weren’t to fussed as bali gains sometimes do smell. Our room was nice and very clean. We found the food at the Gula Gula was good and cheap. We stayed at Baleka for just under a week and it was fantastic! All the staff were extremely friendly, welcoming and took very good care of us. Everyone in the restaurant were so lovely and knew us by name after a few days! The staff at the spa were lovely as well especially Wayan. We stayed in a deluxe room which was great for around $50 a night! Bed was a little squeaky though and if you can’t handle firm pillows bring your own. We were also far away from the construction so we couldn’t hear it at all. The pool is beautiful with a swim up bar and location is close to the beach and great restaurants! I would happily stay here again ! !